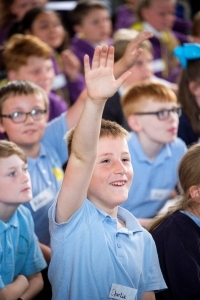 Yesterday, Wednesday 11 July, saw the official launch of Inspiring the Future of Theatre at Northstead Primary School in Scarborough. 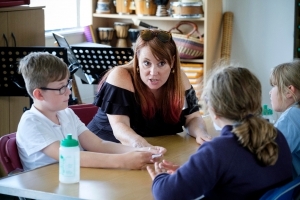 Inspiring the Future of Theatre is a national campaign, in partnership with UK Theatre and Society of London Theatre (SOLT), to encourage people from the world of theatre to visit local schools and speak to children about their job. 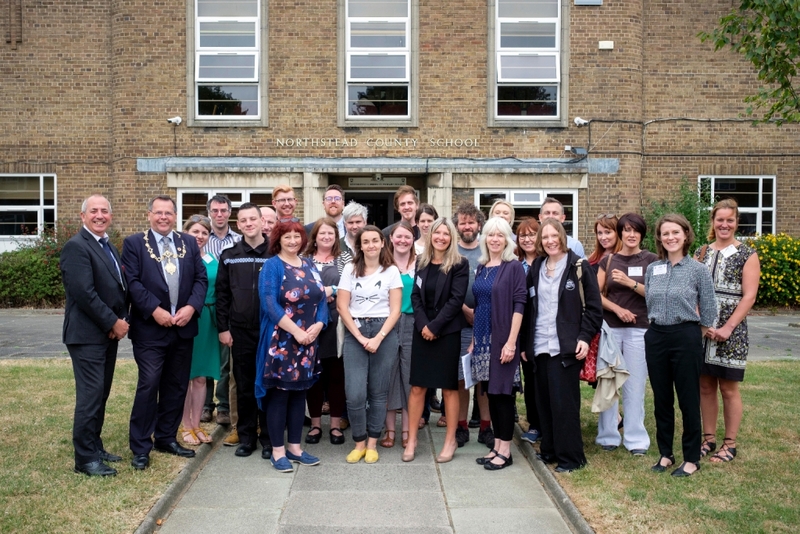 21 volunteers from local theatres joined us at the Northstead Primary for a morning of laughter and inspiration. The morning kicked off with a What’s My Line? activity with a panel of six volunteers from the nearby Stephen Joseph Theatre. Participating children got the opportunity to ask the panel questions about their job, and then guess each person’s role. Highlights included one child asking Chief Electrician at the Stephen Joseph Theatre, Paul Steer, “Do you associate with spies?”. 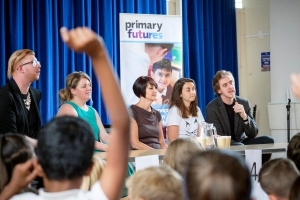 The children were then surprised to find out all the panelists worked in theatre, and that there are so many jobs available in theatre in addition to acting. 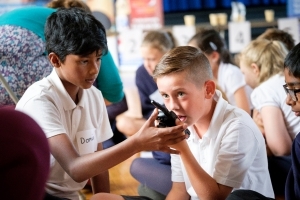 The morning continued with a careers speed networking activity where children had the opportunity to discuss, and ask the volunteers questions about their jobs in theatre some of which were: chief electrician, box office manager, Artistic director, stage manager, theatre designer and were eager to explore some of the props the volunteers brought with them – like the Stephen Joseph Theatre Duty Manager’s walkie-talkie and a tu tu from the Northern Ballet. 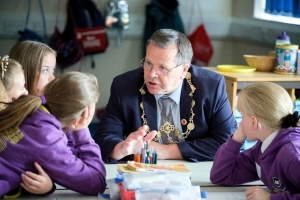 Joe Plant, the Mayor of Scarborough, also joined our theatre volunteers for the speed networking session telling children “any one of you could become Major of this town when you grow up”. As the morning concluded, the children were left noticeably inspired by our volunteers who showed them the huge range of jobs available in the theatre world and showed them how what they learn at school will be useful in their future jobs. Feedback from the children showed they where they would now consider a job in the theatre the emphasis was on off stage roles such as set designer and producer. 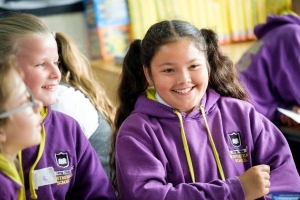 “I found out there is more jobs than I thought in theatre” female pupil aged 11. The volunteers commented on the high level of engagement from the children: “Great event. Well run. The children were very well behaved and engaged. Teachers were great!”. A huge thank you to Northstead Primary School for welcoming us, and to all the volunteers who joined us. As part of the launch, theatres and their employees were encouraged to use the hashtag #InspiringFutureTheatre yesterday. They showcased the great work they do in their local community to encourage young people to consider a career in theatre. We were delighted with the response, which saw #InspiringFutureTheatre trending in the UK all day and over 1300 tweets. Over 700 volunteers from theatres up and down the country have signed up so far meaning we only need another 300 to reach our ambitious target of 1000 Theatre Ambassadors. If you work in theatre, sign up at the top of the page. It only takes an hour of your time a year to visit a local school to inspire children and young people.